No compensation was received for this post. Information about the promotion was provided by Rusty Bucket. Mother's Day is a chance to celebrate Mom! Why not celebrate by getting everyone out of the kitchen and enjoying a meal out as a family? 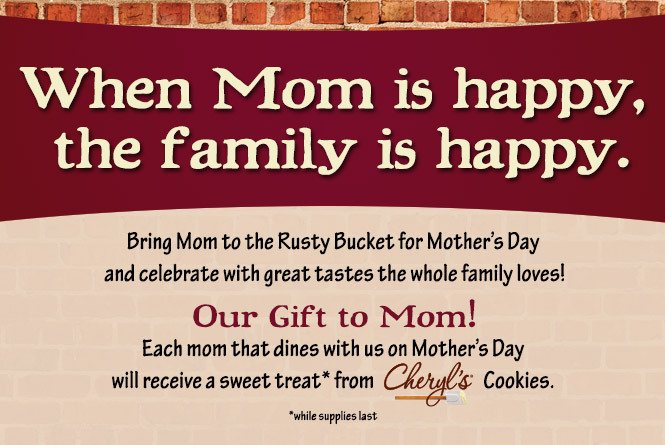 Each mom that comes into the Rusty Bucket on Mother’s Day, May 12, will receive a free Cheryl’s Cookie! (while supplies last). 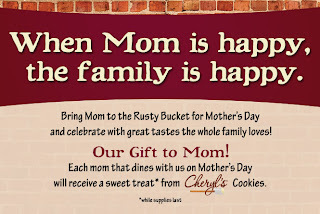 Come celebrate with the Rusty Bucket for a meal the whole family will enjoy! I am getting lots of useful information out of this source and visit your site again. Thanks allot for great information on your webpage.